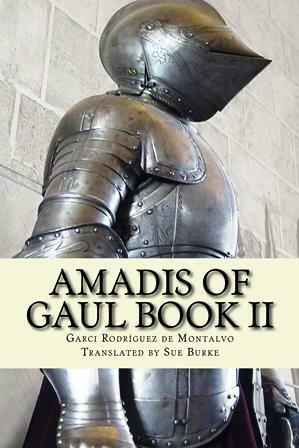 As you may know, for several years I’ve been translating the medieval Spanish novel of chivalry, Amadis of Gaul, as a blog. I finally finished that this spring. The novel was written as four “books,” each one the size of a modern novel. I’ve since been working on collecting the translation into books to self-publish, and since the whole thing would run more than a thousand pages, I’m doing it book by book. Book II of Amadis of Gaul is now available as a paperback and Kindle ebook at Amazon. It joins Book I, also available in paperback and Kindle formats. Books III and IV are coming soon. The blog will remain up in case you want to read the book for free, which you’re very welcome to do. Why would you want to read it? Because this novel is a masterpiece. It inspired a century of best-selling sequels in seven languages and changed the way we think about knights, chivalry, damsels in distress, and courtly life in castles. During the Renaissance, it even led to cosplay! Most of all, this book drove Don Quixote mad. What will it do to you?